Joey Lucchesi. Photo courtesy of the San Diego Padres. 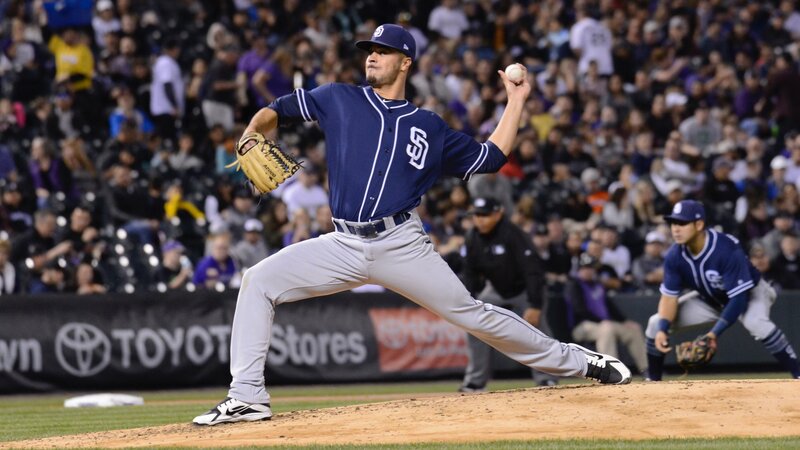 San Diego Padres rookie Joey Lucchesi earned his first major-league win Tuesday against the Colorado Rockies at Coors Field. It was the Padres’ No. 9 prospect third career game in the major and Lucchesi didn’t let a bad first inning, in which his error allowed a two-run homer, throw him off his game. After those two unearned runs, the left-hander struck out eight in six-plus innings to lower his ERA to 1.72. He allowed four hits and became the seventh Padres pitcher in the club’s history to have no earned runs in at least six innings at the Coors Field. While Lucchesi cooled the Rockies’ bats in hitter-friendly Denver, Hunter Renfroe fired them up for San Diego. With two outs and two runners on base, Renfroe hit the first pitch from reliever Brian Shaw, driving the ball over the right-field wall to break a 2-2 tie. The three-run go-ahead homer lifted the Padres to a 5-2 victory over the Rockies and gave the Friars their first series win of the season. The homer was also sweet revenge for Renfroe. It was the same cutter Shaw struck him out with on Monday. It was Renfroe’s first home run of the season after going for 0-for-12 slum at-bat. The Padres will try to sweep the Rockies with Luis Perdomo at the mound for the series finale at 12:30 p.m. PT Wednesday.